Grey trousers or shorts, white shirt and navy blue jumper (logo on jumper). Grey skirt or trousers, white blouse, navy cardigan or jumper (logo on jumper or cardigan). Sky blue and white dresses in summer. School fleeces for boys and girls are available. 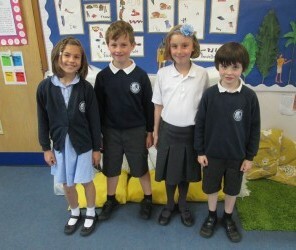 All children need plimsolls for inside use, navy blue shorts and the schools pale blue PE T-shirt. Trainers should be used outside. Children also require a named bag in which to keep PE kit in. Please remember to name all uniform. It means you will hopefully receive at the end of the day what you sent your child in at the start! Items such as jumpers all look the same and generally pupils in class are generally the same size!